← All sound but no picture..
6:30am alarm call this morning. Thats two days in a row, one more for the record. Lots of sweet pastries for breakfast and as much coffee as my bladder would take and it was off to the bus station. At this point I have to say the internet is a marvellous tool for travelling. The cost of a taxi to the park is about 70 pesos, which lets be honest is about 13 quid, not a lot in real money. Problem is Ive been living like a local and have got used to local travel. So 5 pesos from the local bus station to the park, along with the rest of the plebs. The one advantage the local bus has is that it bypasses the main park gate and even at 8am there was a very long queue of tour busses, private cars and taxis waiting to get in. Yet another reason to go the cheap way. Just a short queue to get the tickets and I was in the park. Later that evening a lot of the tourists in the hotel were complaining about being stiffed as foreigners. The price for locals was about 15 pesos or so and for foreigners 85. Thats about 14 or 15 quid. Like seriously folks, if you didnt think the park was worth that, then there is something wrong with your head. Anyway Id bought the grand adventure ticket in the hotel after some not so hard selling by the people in the hotel. Its a 4×4 truck ride through the jungle/rainforest followed by a boat ride up to the falls. A lot of people on the net forums said the 4×4 bit wasnt worth the money and to skip it but Im glad I didnt. I had to exchange my voucher for a ticket and one of the reps said I would be better going on the first tour of the morning. Now I did think this was a bit of a tourist trap as Id already paid and they probably didnt want the later people arriving to only full tours but sure what else was I doing and besides which it wasnt going to get any cooler so why not. Im so glad I did, even though I and the others who had agreed felt like complete tools all 8 of us sitting in this massive flatbed military truck. When we got to the queue for those arriving in the park and buying tickets we filled another 4 trucks. I had been told about the animals, butterflies, spiders and all that but hearing about it and seeing it are completely different things. Ive never seen as many, different coloured, strange looking butterflies in my life and that includes visits to butterfly houses. Forgive the inability to recite the types but to me there were loads of big yellow ones, strange looking iridescent blue ones, bright red ones and the woman sitting next to me on the truck had a small green leaf fall on her and when she went to brush it off it flew away. Some big brown leaves also flew away. Amazing to see. The guide told us about this big spider which had spun webs across our trail, all bright golden thread. By that I mean there were loads of them, just not one man sized spider working through the night. Although travelling down the path in the early morning light if youd told me it was one big man sized spider Id have believed you. Yet another good reason for being the first truck through in the morning. These spiders webs are so strong they can catch small birds in flight and lizards. A few minutes later I had my head pulled back by the treads of one and was spitting out yellow web thread. I wasnt the only one. It was like pulling fishing line or thread off your face, it didnt break just came off in long threads. I did think about keeping some to bring home but I can just imagine US and UK customs allowing that one. After a while we reached the river and it was a long walk down steps to the boats, nothing particularly interesting about that except for the depth markers by the side of the steps long before we could see the boats. Id seen these the day before on the way down to the three frontier crossing point and they started from 40 metres depth downwards. I think the river level at both was about 15 metres. Thats a lot of flooding. As we got to the boats we were advised to put our belongings in big waterproof bags. I came prepared, my camera backpack has an allweather cover and Id put everything in it. My camera is a pro range one and waterproof and sealed (no Im not setting myself up for a fall, it really is). Now you can buy all sorts of attachments for cameras that you can put round them to make them waterproof, housings, see through windows, etc. My weapon of choice is a supermarket carrier bag. Put a hole at the closed end, push your lens through, sellotape it to the lens hood, and the open end is your access to your controls. It just doesnt work with water, but Ive also used it in the sahara for sand protection. Besides which, how wet could it get? Lifejackets on, fully seated, although what good were lifejackets going to do as the boat was surrounded by cayman, we took off, and I mean took off. This is the point where I wish my bloody mac hadnt died and I could at least put a whole load of photos to add – I´ll put them up later when I get home. We sped up to the falls and you hear them before you see them. Theres something primaeval and inherently wrong about humans speeding towards this type of noise. Probably since the dawn of time we have learned to stay the hell away! I dont have the words to describe the feelings of first seeing the waterfalls from up close. A speeding motorboat isnt the place you notice people going quiet but all talk did stop and every one of us just looked with our mouths open. 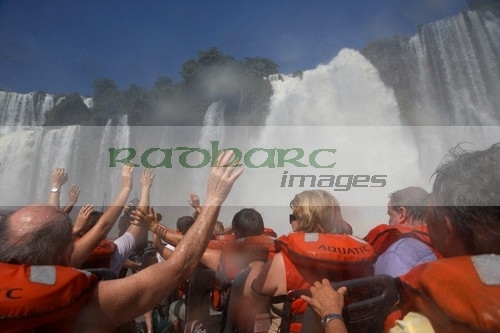 The word Awesome is overused in the english language but if there ever was a dictionary definition of the word it would include ´see going under the Iguazu waterfalls in a boat´. We got soaked, we didnt care. We got soaked again, we cared even less. Up under the Falls, spray hitting you, sun shining, speeding around. Not a care in the world. The guides then told us to put our stuff in the waterproof bags as this was the point of no return. Yes, no, really, we are going _under_ the waterfalls. Up until now we had only just skirted round them. The luggage was stowed, we were told to sit down and they opened the engines up. Now the night before I had done the old travellers trick of getting showered then putting on my dirty t-shirt and shorts and getting showered again, this time with them on to wash them. I thought that was pretty much about as wet as you cold get. Wrong. We disappeared in the worlds biggest shower. The sound was deafening, you couldnt see a thing the water was hitting your eyeballs with so much force, wiping away and holding my hand over my eyes you could just occasionally get glimpses of blue sky. You couldnt see the person in front of you the back of whose seat you were gripping for dear life. Screaming seemed the natural thing to do 😉 As did laughing. If ever there was a case of all sound and no picture, this was it. We came back out of it and everyone was telling whoever would listen about their experience. Of course they were all exactly the same but we just had to tell _someone_ after all I was 10 years old again. People started to unpack their cameras again but we were told that that was only one of the smaller falls, the big one would be next. I can honestly say I have never been as wet in my life. Even if I sat in the bath with all my clothes on, it still wouldnt seem like I was as wet as I got beneath the big Falls. The plastic supermarket bag did its job and I even tried taking pictures of the water falling on me, if only to give one eye respite from the pounding water. Never again will I pay any attention to a shower gel commercial that says ´fresh´or ´natural´ They have absolutely no idea. I take it thats what they mean by 100% humidity then! By the time we got to shore I realised I was out of breath and my heart was racing, we had been the first of the morning and didnt get the chance to see the other boats behind us disappear into the waterfalls and I do mean disappear. Even seeing it I dont think would have prepared us for what happened. The whole ´grand adventure´was 200 pesos, I hate to use the word cost as it wasnt a cost, it was a life experience and those things dont cost money. Just under 70 quid. For those of you going, or going on day trips to Iguazu, spend the money, insist on your tour bus waiting. If you dont, you will regret it. Dripping with water and shaking from the adrenaline rush I made my way back up the lower path to the first coffee shop. You could see the smiles and elation in everyones face, you could see the people walking past us all completely soaked smiling, wondering what the hell they had let themselves in for. I sat down with a coffee and ordered empanadas. They didnt have any empanadas yet as it wasnt lunchtime so I had 2 pieces of cheesebread. Dont have the cheesebread, I will say nothing more. Sitting in an air conditioned coffee shop with an ever increasing pool of water on the floor, I did look like Id just pissed myself again but this time I was in company. People walking past staring, wondering what lay in store for them down the path! Its only then I started to notice the wildlife, big lizards nearby and large raccoon type animals that travelled round in families. The signs said not to feed the wildlife but when the wildlife babies distracted people long enough for the wildlife parents to unzip rucksacks and hunt around in them, its hard not too. Butterflies everywhere. I didnt review my pictures, I´ll save that for when I get home as I was still in the ´did I just do that´stage.When I booked the hotel I did have the choice of the Sheraton which is in the park itself but at over 450 quid for two nights just a little bit beyond paying for that extra. I went round to take a look and it is a nice enough hotel but not that much. If I had only one night it would be a no brainer, you get earlier and later access to the park as you are onsite and you can sit with a beer and look at the falls as the moon comes up. OK thats got to be worth an extra 100 quid just for the bragging rights alone. So on to the trails along the upper part of the falls then the devils throat path in the early afternoon when it was very hot so as not to be as busy. Id hate to see it if it was busy! I was trying not to think of the rest of the day as downhill after the boatride but there was the temptation to just skip stuff and go back and lie down and recover. I skipped most of the lower trail as its a lot of steps and the leg probably wouldnt take it. The upper path was quite short and you could either walk to the devils throat or get the train. Let me think about that one. My 2 litres of water I brought with me was gone in 4 hours, add to that the probably litre I drank under the Falls and it still wasnt enough. It was now around the 40C mark. Id been at this temperature in the Sahara but it didnt feel anywhere near as hot. The walk along the metal walkway out to the Devils throat was scary stuff as you could see the torrents below you rushing past. In the slower sections you could see the fish below, turtles, all sorts of strange things. Birds with BLUE and I dont mean blue, wings, and more butterflies. I knew I was going to be toasted on the way out, it was windy and there were enough baseball caps going over the falls to say that any hat wouldnt stay on for long. A couple of hundred yards away from the end you pass over this island with two large palm trees that look like a gateway and when you pass it you hear that roar again, you see the mist and hear the screaming. This is no downturn to the day. As you get closer the wind changes periodically and you see nothing but you hear everything,more all sound and no picture. The sensible people are in their swimming costumes, Im now as wet as I was in the shower again. Ive lived in Northern Ireland all my life and one of the regular soundbites for the last 40 years has been ´we are standing on the edge of the abyss´ Well let me tell you boys, you have no fecking idea! Looking down you couldnt see the bottom, the noise was tremendous, the spray hitting you, just nothing but pure, natural, raw, energy. The devils throat indeed. Now I could have just taken a few pics and cleared off but it was mesmerising, also fascinating to watch was other peoples reactions, probably just as dumbstruck as Id been. That and just a little bit scared. Did I mention the noise? Bravery award had to go to the onsite photographers who were standing on their stepladders set on a metal frame stuck on metal posts above the garantua del diablo. 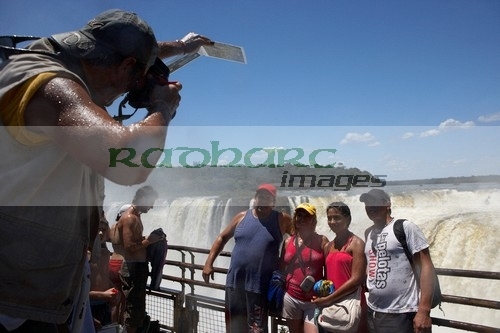 You couldnt pay me enough to stand on the ladder, never mind shout at people and try to get photos in those conditions. So that was it, time to call it a day and head back to the hotel. It had been a very good day indeed. Back at the hotel I tried to explain it as many countless other tourists have tried. The desk staff were smiling the smile of having seen it time and time again and the ´we told you so´ look. 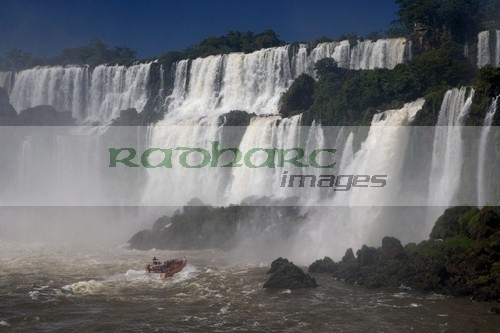 They asked if it had been worth it and I said if Id flown Belfast to London to Washington to Buenos Aires to Iguazu, taken just the boat ride and was about to go back the same way, that would have been worth it alone. I thought Id splurge on dinner in the hotels restaurant. I asked for recommendations from the waiter and he recommended the local fish pulled out of the Iguazu river. I then asked the hotel owner who asked if I liked fish and I told him about years of trout fishing and sea fishing eating really fresh fish, so he said not to have the fish and go for the steak instead! The local fish some people were raving about is just a type of catfish. I have to say the steak was a superb option. The restaurant was full with a tour group from Australia, mostly women so of course I offered my services to do their group photo. After a bit of shouting and herding the photos were done and my steak was almost ready. One of the women came up to me and asked was I from Belfast and I said I was. She said she used to live in Belfast when she was younger before emigrating to Australia and her family still lived there. In Glengormley, just across from the Northcott centre, do you know it? Know it? I live off the Hightown Road less than 5 mins away! All too soon it was time to go to bed as it was another 6:30 am start to go to the Brazil side of the Falls before going home. The late english language movie was Black Hawk Down. 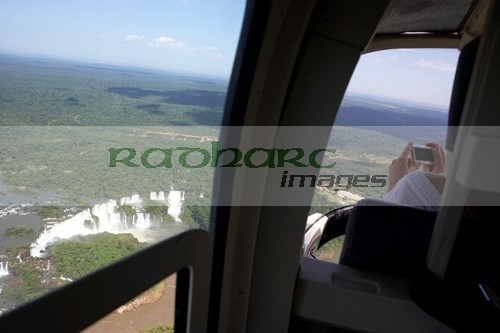 Maybe I wont take that helicopter ride over the Falls after all…. 6:30am quick three Ss (someone emailed to say I wouldnt be brave enough to put a reference to the 3Ss in my blog) and then it was off to Brazil. The hotel arranged a taxi driver to take me across the border, sort out formalities, take me to the park, wait there the 2-3 hours it takes to do the Brazilian side then back again. This did sound excessive but I had to be back at the airport at 2:30 and to be honest after a day in the sun, air con failure during the night I had a bit of heatstroke and the longer I was in air conditioning the better! When we got to the border I saw all the tourists being taken off coaches and the cheap busses, get into line and then go through immigration one at a time, on both sides of the border. The border isnt back to back but theres rather a duty free buffer zone and a great big bridge across the river so two queues. Apart from a small wait until the Samba band stopped playing and the boys on the sandy beach finished their game of football it was straightforward. Ok I made that bit up but it was in my head crossing the border. The hotel got it spot on again and the taxi driver sorted it all out and in half an hour I was at the gates to the park. He walked me to the door, saw I got in ok then arranged to meet me in 3 hours at the gate. Real good service. The Brazilian park is a fraction of the size of the Argentinian one so it only really has one walk and its a 2 hr maximum one allowing for stops and rest points and all that sort of thing. 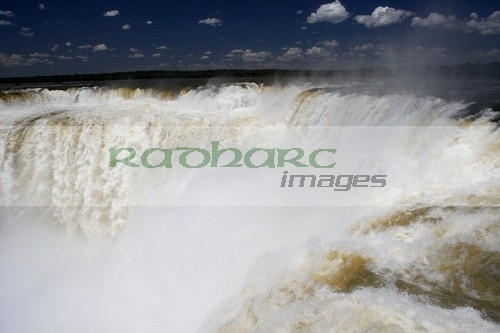 It was interesting to see the Falls from this side as it gave a more panoramic view and particularly with the likes of the Sheraton hotel, put it all in context. I still think the best view is from down in the water but walking along the opposite cliff would again be spectacular if you hadnt done the other side. The cliff path descends to a spectacular walkway which goes right out under the falls and it was time for a soaking again. It was here you could makeout most of the devils throat whereas on the Argentinian side you only really got to see the top of it. Soaked through again but still laughing it was the first time Id ever seen a circular rainbow, you are at the mid stage of that particular group of falls with one behind and one below so the spray is coming at you from all angles including up! The photos will do the talking for this side! It was still an awesome experience and Im glad I did both sides, seems a bit of a shame if you have the time not to do both. I made my way back to the entrance and was still an hour short of my alloted time so I found myself wandering round to the helicopter place right in front of the entrance. I had toyed with the idea of doing this then against due to the whole ecological effects but there is only one operator allowed and they only have one helicopter. Its not like when I did it in the Grand Canyon where it was like a scene from a Vietnam movie with the number of helicopters shuttling around. The taxi driver was parked outside and he wanted to know if I was going back to the hotel but I said helicopter! Now far be it from me to say that they are on some sort of kickback but he virtually led me by the hand into the office and stood by my side entering all the discussions even though the guy there was very fluent in english. I asked for how long I would have to wait and I was told about a half hour which just about tied in with my return time. As always there was a loud, conversation in Spanish and as soon as the visa machine spat out my receipt I was handed a set of earplugs and told to get to the helicopter. Within 90 seconds I was off the ground and away. 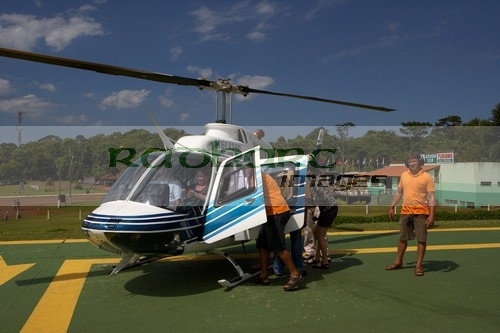 I love helicopter travel, I´ve had about 4 or 5 flights now, all over places like Disneyworld, the Grand Canyon etc etc and its another one of those 10 year old boy incidents. Id always wanted to fly in a bell jet ranger as well and had never flew in one and now I was. I had the rear window seat with the window open so the lens was stuck out quite a few times. I know all flying is three dimensional but theres nothing like a helicopter or light aircraft flight to make you feel all of those three dimensions, its a weird feeling and something I would recommend to anyone, anywhere never mind with the jungle, the rainforest and above all those falls below us. We didnt get too close to the Falls, for obvious reasons but it really did make the experience complete for me. Ive now seen them from all sides, below, above and inside as well. Another case of getting off and telling everyone who was with me, did you see this, that, did you feel it when it banked over etc etc. Ive spent more time being 10 in the last 2 days than I did when I was 10. Back to the hotel and only time left for lunch with that Argentinian special – pizza. Well its Pizza but not as we know it. On my first night here we had pizza. Well it was a cheese and tomato sauce pizza with a few olives thrown in. Thats mozarella man. Was the reply when I asked if they had forgotten to order toppings. So bear that in mind, pizza here is just a base pizza. So I made sure this one had pineapple and ham and sweetcorn and other stuff and very nice it was too. The rest of the time was spent heading to and waiting at the airport, reasonably uneventful flight but in complete contrast to the flight out. As we made our final approach to BA all you could see as far as the eye could see in all directions were buildings. The closer to the airport it was all apartment blocks and high rises. Whilst not on the same scale as the approach to the old Hong Kng Kai Tak airport it did remind me slightly of that. 2 hour flight from a rainforest environment to an urban jungle. That was it, no doubt by far and away the highlight of the trip, almost half the budget of the entire month long was spent in 3 days in Iguazu. And do you know what? It was a bargain.